Businesses grow successfully by managing risk as a core internal discipline or if it is their reason for being by providing risk management services to others as their service proposition. Risk is not all bad so long as it is controlled. In lending and surveying circles there is a growing reliance on technology to manage these risks. 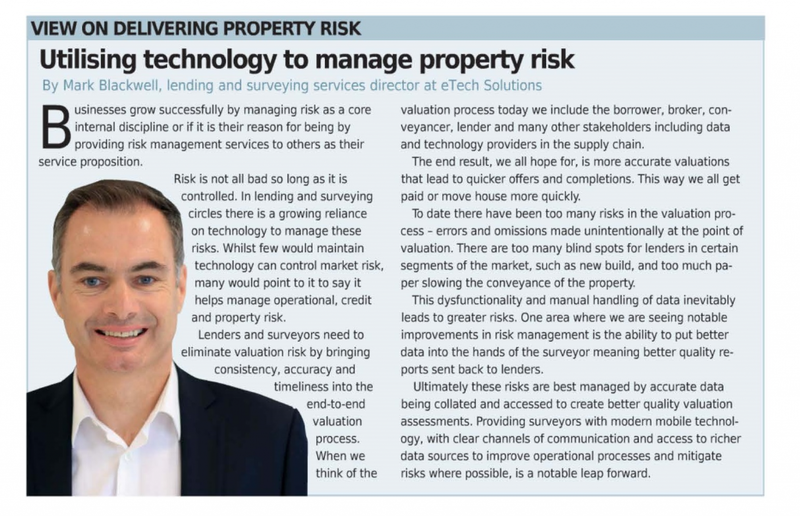 Whilst few would maintain technology can control market risk, many would point to it to say it helps manage operational, credit and property risk. Lenders and surveyors need to eliminate valuation risk by bringing valuation process. When we think of the valuation process today we include the borrower, broker, conveyancer, lender and many other stakeholders including data and technology providers in the supply chain. The end result, we all hope for, is more accurate valuations that lead to quicker offers and completions. This way we all get paid or move house more quickly. To date there have been too many risks in the valuation process- errors and omissions made unintentionally at the point of valuation. There are too many blind spots for lenders in certain segments of the market, such as new build, and too much paper slowing the conveyance of the property. This dysfunctionality and manual handling of data inevitably leads to greater risks. One area where we are seeing notable improvements in risk management is the ability to put better data into the hands of the surveyor meaning better quality reports sent back to lenders. Ultimately these risks are best managed by accurate data being collated and accessed to create better quality valuation assessments. Providing surveyors with modern mobile technology, with clear channels of communication and access to richer data sources to improve operational processes and mitigate risks where possible, is a notable leap forward.